A boundary, or weather front, between cold air in Canada and warm and humid air over the eastern United States is once again set up just to the west of New England. We are on the warm and humid side of the front. Along this boundary we watch thunderstorms develop once again today, becoming strong to severe as they move into New England this afternoon. After a hazy mix of sun and clouds this morning with a few scattered showers, thunderstorms become more widespread from northwest to southeast between 2 p.m. and 7 p.m. Wind is once again gusting from the south past 25-30 mph near the shore. The ocean is choppy with a 2 to 4 foot seas. We have a mid-day low tide, so it will be high tide just before the sun goes down. A good evening for fishing as long as you keep an eye on the sky because some of the storms will make it all the way to the coast. High temperatures today will be in the 80s with the dewpoint near 70 degrees. Not everyone gets the torrential rain, but those who do could see 2 inches or more in a very short time. 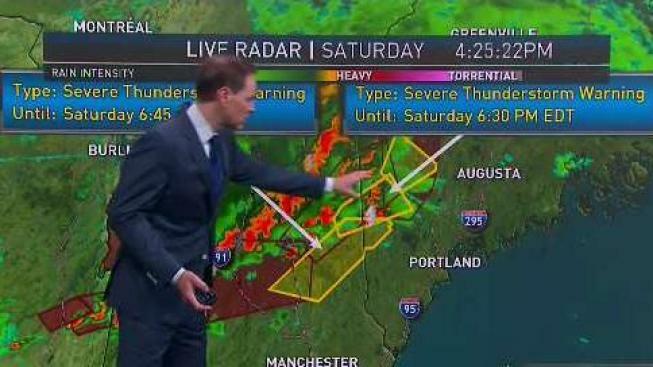 That's why we have a flash flood watch continuing for much of Vermont, New Hampshire, and Maine. Evening showers and thunderstorms will only slowly subside overnight, and we may have ongoing rain on Cape Cod right late night and into sunrise. The back edge of the rain is the leading edge of less humid air. Tomorrow looks fantastic with much lower humidity and a brighter sky. Temperatures warm close to 90 degrees in eastern New England with the wind from the west 10 to 20 mph. It's also a much nicer day in the lakes and mountains with sunshine and fair weather clouds with temperatures in the 70s and low humidity. The threat for thunderstorms tomorrow is very low. Tomorrow night looks comfortable with a low temperature in the 60s. There is another weak front coming from Canada on Monday that may trigger an afternoon shower and perhaps a thunderstorm. But any showers or thunderstorms on Monday are few and far between and to go away by fireworks time. Independence Day on Tuesday looks like a beauty with sunshine and a few fair weather clouds and a high temperature in the 80s. It should continue a pretty great week for a vacation, just another threat for showers and thunderstorms Thursday night and early Friday, with seasonable temperatures and not too much humidity.